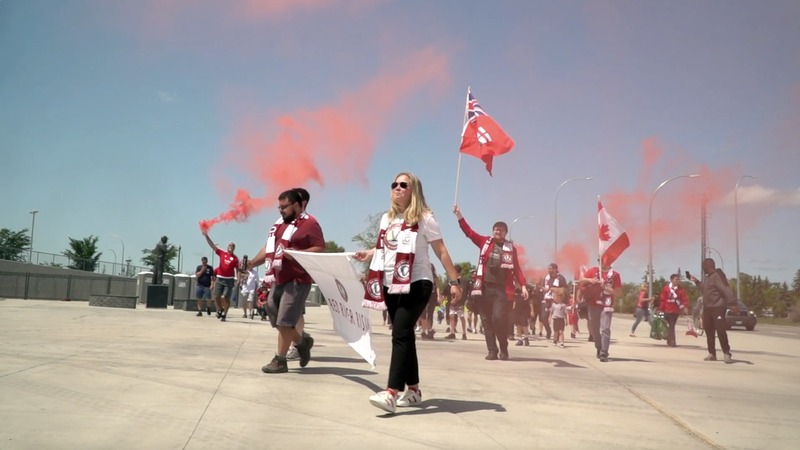 In this series, passionate soccer supporters tell their stories of falling in love with the beautiful game, and how they’re helping lead the charge in their communities to support new clubs in the Canadian Premier League. Adam Johnston first fell in love with soccer in 1996, when the Winnipeg Jets moved to Phoenix, Arizona. For Johnston, and many others like him, the Jets’ move left a void in the sporting landscape. 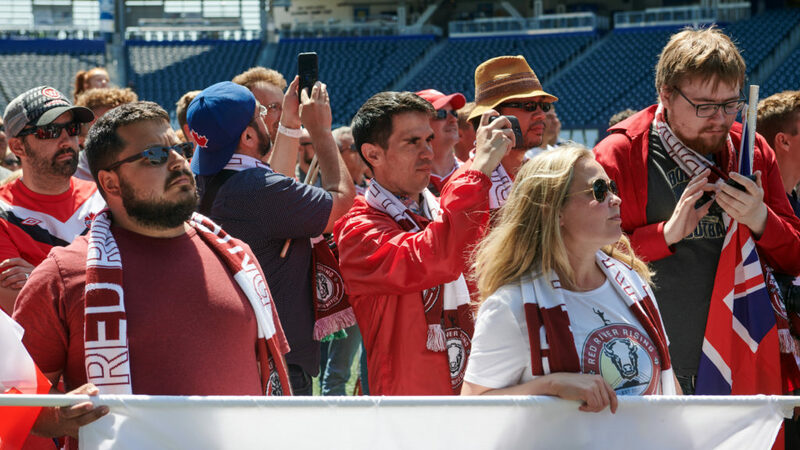 Two years later, the 1998 World Cup inspired in Johnston a passion for another game, one that has since seen him connect with other soccer fans and helped to found Red River Rising, a supporters’ group for Valour FC. A 38-year-old tax preparer and small business owner, Johnston and his peers eagerly await April of 2019 to see Valour FC kick off in the Canadian Premier League, with about a dozen supporters meeting regularly in the buildup to the inaugural CPL season. Johnston remembers the day he and his fellow supporters finally realized a dream they always believed would come true – professional soccer in Winnipeg. “That day, it was May of last year, I was cleaning my room and I was checking on Twitter, and I knew that the CSA was having meetings and they were going to formally get the Canadian Premier League announced,” Johnston said. “I read about Hamilton being one of the founding clubs, but I was happily surprised to see that Winnipeg was also going to be one of the clubs. Johnston speaks about these new traditions and rituals with palpable anticipation. Since January of 2017, Red River Rising has met once a month at Garbonzo’s Pizza Pub near the University of Winnipeg, to discuss and plan events, swap ideas for songs and banners, or talk soccer – whether local or Spain’s La Liga, Johnston’s European league of choice. Their slogan – Rise Together – matches the group’s operation style, as all members get a vote when matters like names, logos and songs come up for debate. Johnston is cognizant – and hopeful – that the traditions he and his peers establish today will last for future generations, too. That legacy is founded from a unique soccer landscape. Winnipeg was once Canada’s soccer capital in the late 19th century, and the Manitoba Football Association is the oldest provincial soccer association in Canada, founded in 1896. The beautiful game has deep roots in Winnipeg’s past, and it is that history, coupled with a changing population makeup, that makes the city one to watch in Johnston’s view. Like many supporters, Johnston said he and Red River Rising hope Valour FC can compete for trophies, especially the Canadian Championship and the CONCACAF Champions League, but he outlined the desire to see the club build “a winning tradition” as another top priority. Johnston already feels that Valour FC has made a mark in the city’s soccer landscape, too. 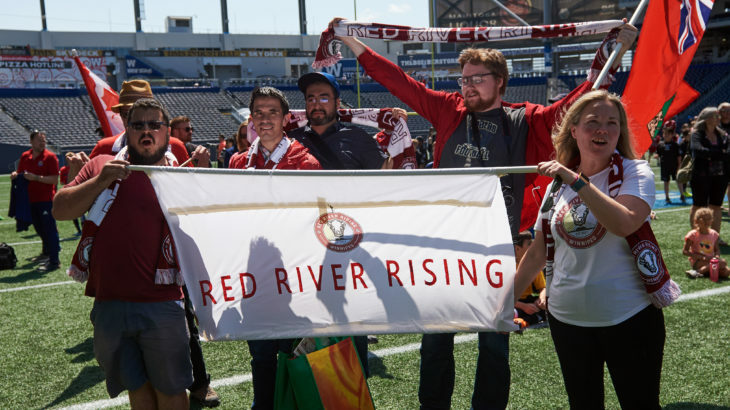 You can check out Red River Rising over at www.redriverrising.ca for more information about the group, as well as valourfootball.club to secure your membership with a deposit ahead of the CPL’s inaugural 2019 season.